The Open Series by Montecristo are by far my favourite Montecristo smoke. Great draw and mild in taste and flavour. I thoroughly enjoy the Open Eagle as it is perfect cigar when you have an hour and a half of time to dedicate to a good cigar. The deeper you are in the cigar, the more it gives back. An enjoyable smoke. It's no #2 or Edmundo, but still worth checking out. I like it best in the early afternoon, paired with coffee. I smoked the last Open in the 20-stick box today, with 1 year of age on it. It performed marvelously. The flavors were tea leaves, cinnamon, cocoa and aged tobacco but in a very refined and smooth evolution and journey down to the nub. What a waste! This was the last in the box and the best one to date. I had decided to gift a number of them after reading negative reviews to get my buddies' opinions on them. My views, then, coupled with harsh undertones 3 to 4 months after purchasing the box forced me put them totally out of my mind!! I should have been more patient and now could have reaped the reward - But alas, now, that is out of the question! Mind you I have put orders on acquiring a box or two and only after correctly aging it for a year, I am going to start my endeavor in smoking them. I received my box of 20, freshened them up in the humidor for a few days even though they didn't need to since they were/are already wonderful smokes handled as advertised. I found the pre-light draw sweet. 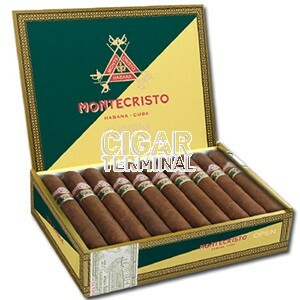 First third was light but definitive of a Montecristo. Second third was very good, the flavors were beginning to develop and enhance, pure enjoyment... The final third was packed with all the wonderful spices, woody flavors I have come to enjoy.